CMU Dreamroom is the proposed solution to a design opportunity researched with two other students, Noah Johnson and Deepak Ravi, over the course of the semester. This process, seen in the black and white posters we used to discuss our progress with professors, helped me to learn the importance, of user-based design solutions and human-centered qualitative research methods. The process started with problem identification and quickly continued onto exploratory research methods. We primarily interviewed current Carnegie Mellon students and Housing Services employees about problems with move-in day. 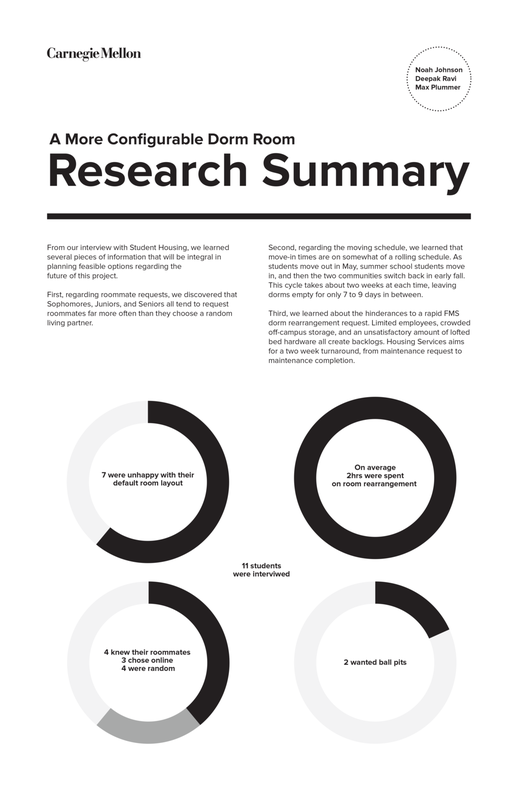 After this research to confirm our perceived design problem, our team moved to more explicit research methods. 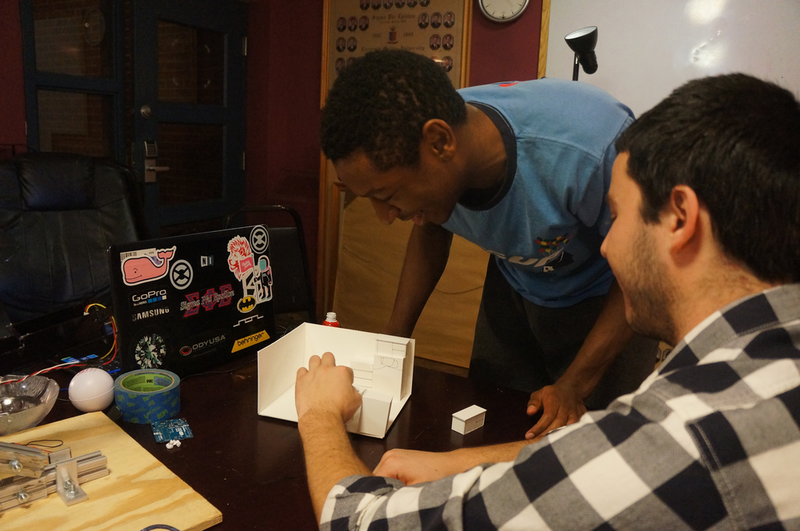 Our most successful research method was another round of meet-ups with current students, where we brought a 3D model of standard dorm room furniture and a standard dorm room size. We encouraged our peers to play around with furniture layout, decoration, and more. Lastly, we used our research findings to propose a solution on a final 18"x24" poster. Our solution is CMU Dreamroom, a software service provided by the university where incoming freshmen can layout their dorm rooms in an orthographic room-specific online environment. This solves students' problems of configuration delay, roommate communication, and lack of information about room dimensions. 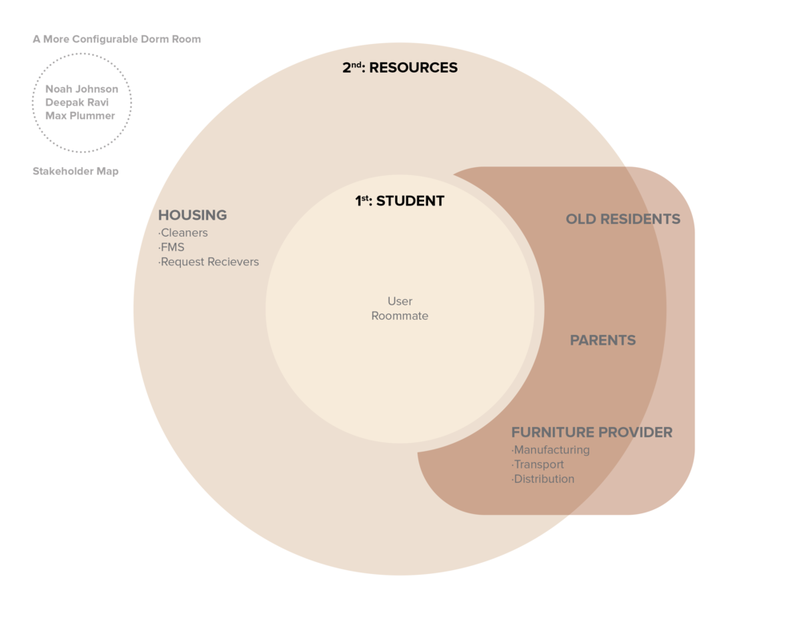 It also solves Housing Services' problem with service request overload in the first week of classes as all students configure their rooms at once. Below is our process work. The three of us all shared responsibility on all aspects of the project except for final poster graphic design, where Noah Johnson carried the torch.